To quote Singaporean food blogger Leslie Tay, "Never waste your calories on yucky food!" This is even more important for visitors to Singapore who have a limited number of meals to sample the city's diverse and delicious cuisine. Thankfully, there's no shortage of food apps to direct smartphone-toting travellers to the most mouthwatering meals. 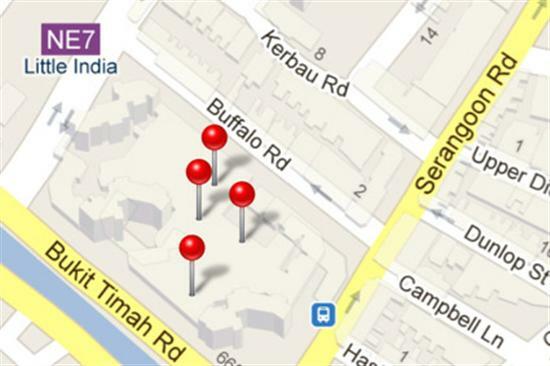 The Ieat app reveals the best hawker stalls within walking distance. Note: The apps require internet access for full functionality, so consider investing S$15 in a prepaid 3G microSIM card. 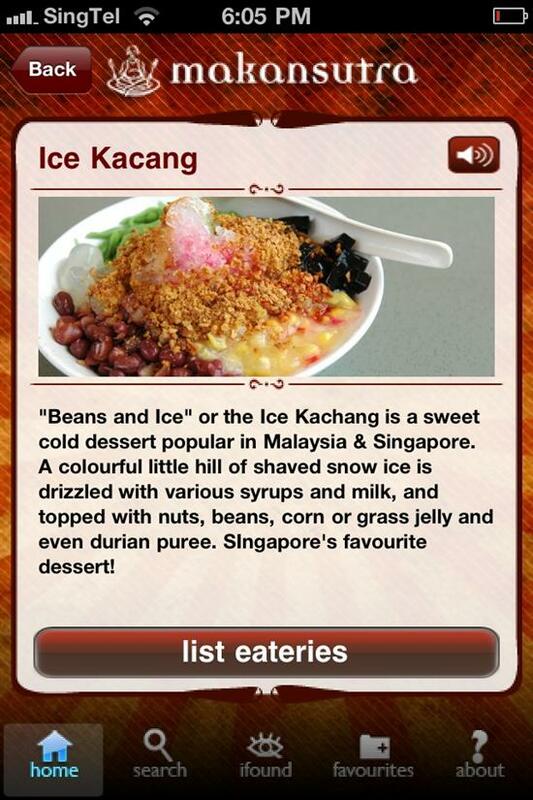 ieat hawker: If sampling the best of Singapore's hawker food ranks high on your to-do list, then this is the app for you. The listed stalls are selected by food blogger Leslie Tay of ieatishootipost.com (and the clever quote above) and organised into categories like 'crabs', 'laksa', and 'kopi and toast'. The full version is definitely worth $0.99 and lists multiple stalls per category with a full review, photos and ranking out of five stars. But the app's best feature is definitely the interactive map: use GPS to locate yourself and it'll highlight recommended stalls nearby. What are you waiting for? Go eat! Makansutra: The foodies at Makansutra are undoubtedly the experts on the best Singapore hawker food with their annual print guidebook, TV series, and now a free app. The different food categories are presented with mouthwatering photos, and tapping on a dish results in a general description and audio of how to pronounce it (useful for Chinese words like cze cha). The recommended stalls are definitely the best of the best (like Tian Tian chicken rice), but there aren't very many of them – just three listings for where to eat chicken rice and zero for chilli crab. I suspect this free app is still a work in progress, but it definitely has potential. Hungrygowhere: This free app is a companion to the popular HungryGoWhere website with thousands of user-generated restaurant reviews. This means it's incredibly comprehensive – you'll even find reviews saying which McDonalds has the best service – but, since the reviews aren't by a trusted critic, you'll need to take what you read with a grain of salt. For each restaurant, the app lists full contact details, opening hours, average prices, recommended dishes, and an overall approval ranking (out of 100%). If you're in the mood for a certain kind of restaurant, the ability to search using multiple tags results in some excellent recommendations. For example, searching for a 'midrange family-friendly Vietnamese restaurant near Orchard Road' results in the yummy Orange Lantern Restaurant.